Located on a headland approximately 50 miles south of San Francisco is one of the west coast's most beautiful lighthouses, the Pigeon Point Light. The name Pigeon Point comes from the wreck of the clipper ship ‘Carrier Pigeon’ which came to grief on the rocks just off the point in 1853. Maritime traffic increased as San Francisco grew and mariners called for the treacherous area to be marked, but the Lighthouse Establishment moved slowly to select land and obtain a site. In the meantime, other wrecks occurred and public outcry intensified. Finally after years of negotiations with land owners, the federal government purchased land at Año Nuevo Island and Pigeon Point for lighthouse purposes in 1870. 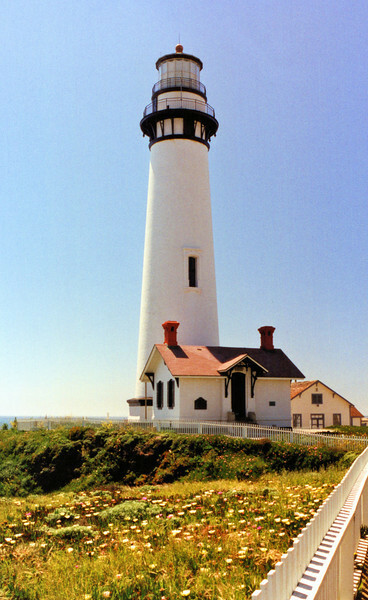 Construction of the Pigeon Point Lighthouse commenced in 1871. The 115 foot brick conical lighthouse was to be the tallest on the west coast along with the light at Point Arena, California. The design used for the light was similar to those used at Bodie Island and Currituck in North Carolina and Yaquina Head in Oregon.